« Stay Rad Wine Blog TV Episode 47: Stay Rad Turns One! I dragged Kara to the kitchen, where I pulled out two glasses and a bottle of wine. Kara and I picked this up at the Rodney Strong winery in Healdsburg last summer, while celebrating our one year wedding anniversary. It was 25 bucks. Nose: Raspberry, blackberry, and plum fruits are all present on the nose. There are subtle hints of tobacco leaf as well. Taste: Nothing subtle on the palate. This wine is ALL TOBACCO! I mean… Big time! There a good plum fruit to this, and some nice lavender notes, but what you will remember is the big leathery tobacco structure. The website says to enjoy this over the next 3 – 6 years, but I think the Rodney will still be going Strong (See what I did there?) for the next 10. The tannins were a tad bit astringent on the finish, but one would expect that to fade over time. Score: A fantastic 92 point effort from Rodney Strong. I highly recommend the Alexander Valley, girl. 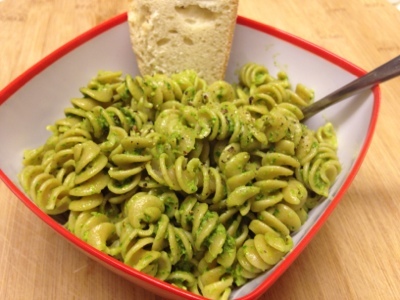 There was a very pleasant piney mintiness to the pesto. When combined with the tobacco flavors of the wine, there were some really neat chocolate notes that came out of the Cabernet. Sure, Kara made the meal, but I like to think that my drinking wine had something to do with it. This entry was posted on June 12, 2012 at 1:34 pm and is filed under Uncategorized. You can follow any responses to this entry through the RSS 2.0 feed. You can leave a response, or trackback from your own site. 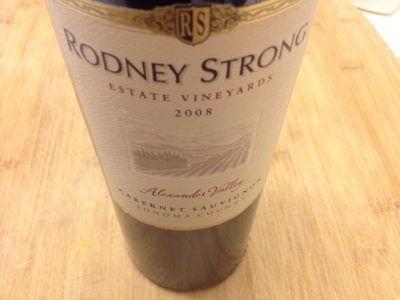 Hi, this is Rodney Strong Vineyards. Thank you for your lovely blog post on our Cabernet. The pasta you paired with with our wine looks delicious. Today, we shared your blog post on our Facebook page and our fans would love to have the recipe! Do you happen to have a recipe? If so, please post the recipe to our Facebook page or reach out to us by email at social@rodneystrong.com. We look forward to hearing from you! Cheers! Thanks, Rodney Strong. I’ll get Kara to write out the recipe for me.